We have designed our line of freestanding portable double fitness barres to be truly easy to move around while maintaining stability and durability. As with all our barres, we use high quality, yet lightweight aluminum. We use industrial powder-coating finish to make sure they are scratch and chip resistant. They will endure the demands of any barre fitness program so they will last ….and last! Our sizes start at 4’ and go up to 20’ with various size options in between and come in Gray, Black and White. You can even choose to have maple finished barre inserts with aluminum ends. 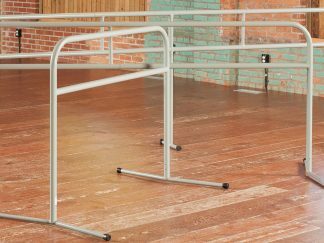 Our freestanding barres that are longer than 10’ include one center support. Barres over 18’ include two center supports. Our double fitness upper barre height is 42.5” and 31.5” for the lower barre. Moving them around is a snap! Also, swivel the feet to store them, transport them or move them through narrow spaces. It’s all about the core! Use our barres for stretching, balancing building your core and for physical therapy.